Manuls or Pallas' Cats are the oldest living species of cat, traceable in the fossil record to 10 million years ago. They were once thought to be the ancestor of the domestic cat Persian breed because of their highly unusual face. Manuls live on the rocky plateaus and riverbanks of Central Asia. What do manuls look like? 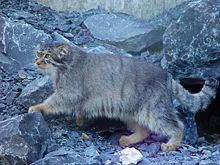 The manul is similar to the lynx in facial structure, with a large, sturdy body and short legs. Its head is short and broad, with large round eyes and blunt wide-set ears. Its long, silky coat varies in color from light gray to russet brown, with white tips to its hairs giving a sparkling, almost iridescent appearance. There are dark lines on its cheeks, rings on its tail, and its lips, chin, and throat are white. Pallas cats are the only living species of small cat whose eyes have round pupils. What do manuls eat, and how do they catch their prey? Manuls hunt by night, from the ground, and seek small mammals and birds. The vast majority of their diet is a small animal called a pika (pronounced PY-kah) that is closely related to rabbits but has small, round ears. Where pikas are plentiful, a manul will eat almost nothing else. The name Pallas' Cat came from the first scientist to describe one, Peter Pallas. This page was last edited on 9 June 2014, at 16:47.